Type Speed Test app for Windows 8 delivers an easy and highly convenient practicing interface for improving your typing skills. You can easily locate it under ‘Games / Strategy’ category of Windows Store. This Windows 8 typing speed test is 100% free and a good choice for people interested in improving their typing speed and accuracy. It does not includes any fancy typing games, but is simple and effective at same time. 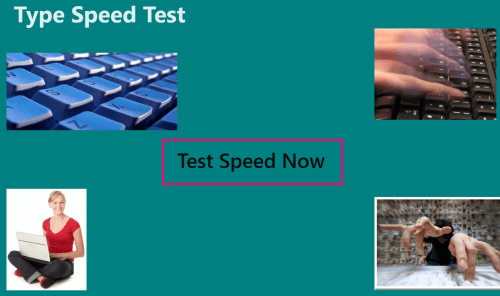 On launching Type Speed Test app for Windows 8, you will be presented the interface as in the screenshot below. In the center section exists the link stating ‘Test Speed Now’. Click on it and in no time you will be redirected to a following window. The page contains three links ‘Generate Text’, ‘Level’, and ‘Help’. You must begin with a click on ‘Level’ after which you will be asked to prompted to select your typing expertise level. Now, you will have to select the appropriate radio button and click on the Back button. Then, click on ‘Generate Text’. On doing so you will be redirected to a new window containing a randomly selected paragraph with a large textbox below it. After typing the paragraph or while in-between you can click on ‘Stop’ button and the score will be presented to you stating your Words typed per minute and the accuracy. You can do is to take another test by clicking on ‘New Speed test’ and try typing in a calm and confident manner. The procedure remains will remain unchanged. Also, check out our posts on IQ Test Apps, ESPN Apps, and Apps. Type Speed Test App For Windows 8 can be easily installed by opening this link in Supported web browser such as Internet Explorer 10 or advance. Then you require clicking on ‘View in Windows Store’ button after which you will be redirected to application overview page in Windows Store. Finally, click on ‘Install’ button and this 521 Kb app will be downloaded within minutes. 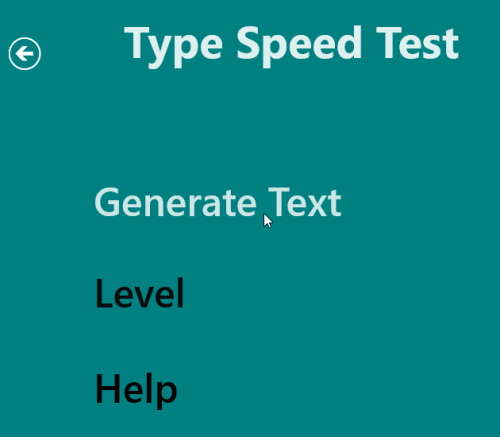 Type Speed Test app For Windows 8 is a nice way to improve your typing speed with accuracy. Its simple, free and helps in increasing your productivity.